Today I spoke at the International Association of Democratic Lawyers congress in Brussels. In the audience there were over 500 hundred progressive lawyers from over 50 countries. Many of these lawyers focus on human rights issues. I called on the lawyers attending the congress to join me in campaigning for environmental protection and protecting environmental human rights defenders. Below is a summary of my remarks. Work is getting tougher and tougher for lawyers worldwide, especially those working on human rights issues, including the lawyers representing environmentalists. We at Greenpeace can confirm this based on our work around the world and in our collaboration with big and small NGOs and individual activists fighting on the frontlines, and on the coalface, of environment destruction. According to the Global Witness report released during the Congress, at least 908 people were killed in 35 countries protecting rights to land and the environment between 2002 and 2013. Moreover, 2012 was the worst year so far to be an environmental defender, with 147 killings - nearly three times more than in 2002. Impunity for these crimes is rife: only 10 perpetrators are known to have been convicted between 2002 and 2013 - just over one per cent of the overall incidence of killings. The problem is particularly acute in Latin America and South East Asia. Brazil is the most dangerous place to defend rights to land and the environment, with 448 killings, followed by Honduras (109) and the Philippines (67). The sad reality is that being an environmental activist is also deadly. 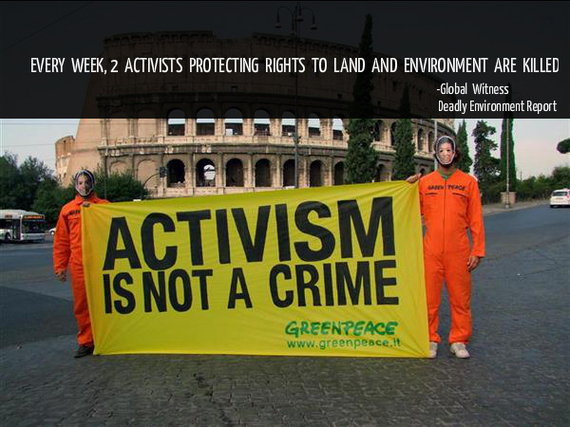 Thanks to people like Billy Kyte of Global Witness for exposing the very scary fact that 2 activists protecting rights to land and environment are killed per week. Our own experiences for example in Istanbul's Gezi Park and in the Russian Arctic last year made me realize how difficult it is to be a peaceful protestor in the current political and legal climate. It takes an incredibly committed individual to stand up against the all powerful - whether they are governments or oil companies - when those individuals have their security put on the line in order to protect all of our rights. The 28 Greenpeace activists and two freelance journalists who faced piracy charges following their peaceful protest in the Russian arctic had no chance of receiving a fair trial. Luckily, the Arctic 30, as we call them, had their freedom secured by the millions around the world who stood up and took action to defend them. But most Human Rights defenders are not so lucky. Environmental campaigners are under attack. Indigenous communities fighting to save their own homes, are too under attack. Governments and corporations are increasingly putting them under immense pressure. Some are being charged with terrorism and piracy, and jailed, silenced and even killed. Their fundamental rights and freedoms are being violated-- freedom of expression, freedom of assembly, freedom of association - even the right to life itself. As we meet today, Greenpeace worldwide is facing about 72 million euros in damages claims and our activists collectively face decades of jail-time as a result of peaceful campaign efforts aimed at exposing environmental problems. Corporations are seeking court orders to permanently stop protests. We need vigorous action fighting public backlash and regressive laws. We need the support of human rights lawyers in strategically defending environmental activists and NGOs from government and corporate attacks. 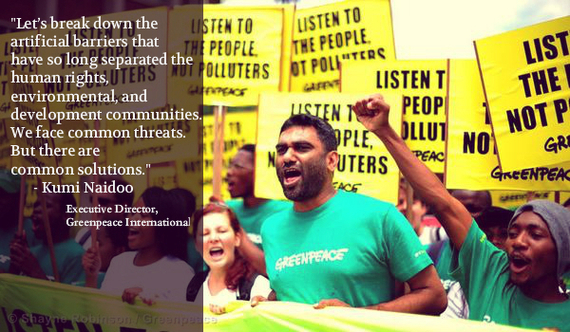 I urge human rights lawyers to be creative and fearless in defending environmental activists from injustice. Let's break down the artificial barriers that have so long separated the human rights, environmental, and development communities. We face common threats. But there are common solutions. Sharan Burrow of the International Trade Union Confederation, in a meeting with the UN Secretary General, Ban Ki Moon, noticed that the he was a bit unsure why she was even there because the topic of the conversation was climate change. She said to him, you might be wondering why as a trade unionist I'm so concerned about the climate. That's because 'there are no jobs, decent or indecent, on a dead planet.' As my good friend, Richard Harvey, one of the organisers of this Congress, rightly points out; there are no human rights on a dead planet. So to bring it home, there are no lawyers or clients on a dead planet either.